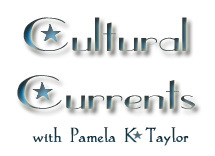 I am starting a new column over at MWU, Cultural Currents . It's going to be about Muslim cultural stuff -- everything from book reviews to preserving our cultural heritage to... well, whatever I want. Anything to do with Muslim culture! I designed my own logo, which required an inordinate amount of fiddling with font to get exactly the look I wanted (and even then I went in a photoshopped a few of the letters...). I might start using the star with my K as a regular feature of my online signature. So often people assume I'm not Muslim, given that I don't have a muslim name and am on the liberal end of the Islamic spectrum. My editors at RNS always want me to state that I'm muslim in the first paragraph. I'm really resistant to the idea of taking a psuedonym. I could change Kay to Khalid (a la a hypenated last name, but it's not particularly Islamic to change your last name) Something like Khatiba or another name with Muslim overtones, but none of them sound quite right. Maybe the star in the crook of the K would work enough to make people think, ok something's different here, and then realize oh, it's a reference to the star and moon. Or maybe, I'm just dreaming and people will never get that kind of stylized symbolism. I love the logo! And I think the star in the crook of the K is not only aesthetically appealing, but a fairly broad hint as to who and what you are. I'll be writing under a pseudonym for a while, but that's a coldly calculated economic choice! I think remaining Pamela K. Taylor does more to let people know there are American Muslims who are not of Middle Eastern ethnicity, but the mix of backgrounds that all of us tend to be. Congratulations on the new column! Like your K, actually - very kool.